A Blog: Hope Birthed in Hardship! Many are not happy with where they are in life. There is this underlying assumption that things can always be better and should be better. Even our society promotes the idea that if you can improve your life, you should. I agree, but I find it creates tensions when the place we are might be where God wants us. A lot of the preaching I hear today is abou t improving your life far more than it is about offering courage for the hardships of life. Thus, we hear buzz words like, purpose, destiny, vision and so much more as motivators to press toward a better life. Consequently there is less emphasis on the return of Jesus and the hope of eternal life, because the focus is more on what God can do for this life. Those who pound the pulpit with the narcissistic aim of seeing what the Bible has to say to make my life better are sending a mixed message. It rarely works. The person who suffers from poor health, or depression, or financial hardship ends up blaming their lack of faith, or if brave enough, blames God when things have not gone as well as the preacher promised. It’s hard in our, “I can do it”, and, “God wants you to thrive”, environment to understand what courage looks like. We are told to be victorious, rise above our problems, overcome our hardships more than encouraged to be strong in those hardships and trust God with the problems. Most of what I read in my Bible helps me to endure, and trust and lean on Jesus, more than it tells me that if I trust God enough things will get better. I learn more about Jesus and His deep love for me in hardship than I do in deliverance. 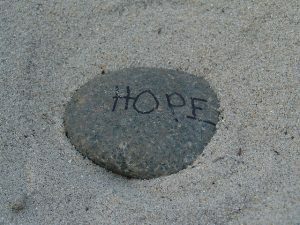 Hardship doesn’t only increase hope and faith, it introduces me to hope and faith. I know in my life, if I received everything I wanted, and if I wiggled immediately out of every hardship because God promised it, I would not trust Him very much. My impulse when something comes my way that I don’t like is to fight it. My discipline, coming out of growing up and maturing spiritually, is to ask what it is Jesus has me there for, or what does He want me to discover about Him, and even about me, by having me there. I suffered severe depression through my high school years. I was institutionalized for a short time, and received lengthy psychiatric treatment during the entire time. My parents left the mission field because of it, and faced an uncertain future as they watched me slowly recover. My pre-teen and most of my teen years were robbed of normality. On several occasions I seriously considered suicide. It was not the lack of courage that kept me from doing it, but the know-how. Why did God not immediately rescue me from this agony? My parents, and many others pleaded for Him to. I know He heard those prayers, but for His own reasons He choose a different path for me. Sometimes I will delay asking God to deliver someone from a hardship by first asking Him to reveal Himself to them during the hardship. I know it is unlikely that they, or I, will get it unless the conditions are rough. This last week a young CEO of a thriving company equalized the playing field and gave each of his seventy employees the same salary. The million dollars he made created an unhealthy disparity to the twenty or thirty-thousand dollars his employees were making. So now, everyone, including the CEO, receives a salary of seventy thousand dollars. I wonder what the work environment will look like in six months, or one year from now? That the person who barely earned the high salary, receives the same reward as the person who puts in sixty hours a week, and put His life and guts into this job, I suspect will create some new tensions. Imagine if God leveled the playing field and took away all the disparities, and gave you everything you asked for when you asked for it, and never placed a hardship on you, or if He did it would be no harder and different than what He asks of anyone else. A person’s years in the faith, and level of maturity, is no longer a factor to how God works in you and what He demands of your life. He rewards you without ever asking you to grow, and earn the strength of your faith, birthed out of hardship. I don’t believe any of us would see that kind of world as very attractive. I am not necessarily thankful for the hard things God has asked me to take on. But, I am thankful for what He did during those trials. I would not be who I am today. I would not know Him as I know Him, because in the hardest trials I was forced to look away from myself to Him. I would also not look forward to seeing Him again as much as I do, had it not been for those many times I longed for Him when He seemed absent. I like the preaching I hear today that speaks of courage and trust, hope and faith, far more than I do the kind of empty preaching that by-passes all this by telling me God is so good He will deliver me and give me what I want now! Next Next post: Do I Need to be Perfect for God to Use Me?